5 things you might not know about Evoqua and nuclear power. 1. Intake is just the beginning. You may be used to thinking of Evoqua as the company that supplies and services your intake systems. Absolutely! But we do so much more in your plant. As one of the nation’s leading makers of water treatment systems, we provide equipment and services that move, handle and treat just about all the water in a nuclear power plant, to the nuclear industry’s exacting standards. That includes water intake, boiler feedwater, cooling loops, steam condensate, discharge and wastewater. For example, we make some of the industry’s most sophisticated resins for nuclear cooling water, along with high-performance purification filters. 2. Long before nuclear, we were a power. Evoqua has been in the water treatment business for more than 140 years, pioneering such vital innovations as chlorination for municipal water. We grew up with the power industry, from its infancy through the growth and maturity of coal and nuclear technologies. 3. Your system may not say “Evoqua,” but there’s a good chance it’s one of ours. With more than 80 years of experience in power plant water treatment through such Evoqua legacy companies as USFilter, Permutit, and Illinois Water Treatment Company (IWT), we provide services, equipment, resin, and spare parts to many of the largest power companies in North America and worldwide. Our intake products include traveling water screens, grab rakes, stationery screens, bar racks and the electronic controls that drive them. And you’ll recognize the brands: Link-Belt®, Rex®, Envirex®, FMC® and USFilter®. 4. We’re all about water … and under it too. Your intake systems need constant maintenance and repair because of the beating the environment deals out. With more than 10,000 intake systems installed worldwide (more than any other company), we know what needs to be done and when. And we’re staffed to do it, whether it’s on the surface or below. Our ally in this mission is Underwater Construction Corporation (UCC), the largest nuclear-certified diving company in the country. They have more than 200 divers, and more than 50 years of experience. 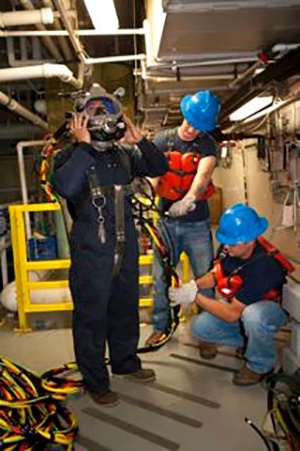 UCC divers are qualified to work not just on your intake systems, but throughout the plant as well: on the reactor vessel, fuel pool, fuel transfer system, suppression pool, intake and discharge systems, pumps, cooling towers and storage tanks. UCC also provides underwater stainless steel welding on reactor internals, underwater plasma arc cutting, fuel storage rack installation and removal, coating inspection and repair, and concrete repair. With UCC and Evoqua working together, all the parts and services you need—not just for intake but for just about anything water-related in your plant—will now come from one cohesive team. With Evoqua often having the original specs, you’ll save time and money on redesign, while UCC installs, repairs, or refurbishes your system within a single coordinated effort.